(CNN) -- Seven-time world champion Michael Schumacher could be set to make a shock return to Formula One as Ferrari look for a short-term replacement for the injured Felipe Massa. 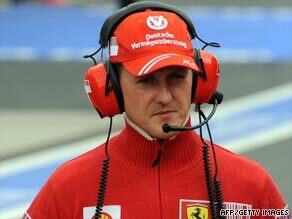 Michael Schumacher remains very much part of the Ferrari set-up as an advisor for the Formula One team. The 28-year-old Brazilian is currently in intensive care at the AEK military hospital in Budapest after suffering a fractured skull in a freak accident in qualifying for Saturday's Hungarian Grand Prix. Massa's condition has improved in the past 24 hours with doctors taking him out of a medically-induced coma on Monday night. He has since responded well to questions and Peter Bazso, the medical director of the hospital, claimed on Tuesday morning that Massa might be able to walk out of the hospital in 10 days' time. "My expectation is that he would walk out of the hospital on his own. If his recovery continues, I wouldn't rule out that he could leave within 10 days," Bazso told Hungarian TV channel M1. "He's spending more and more time awake, talking to family and friends. I would like to point out that, although he is recovering, this is not the end of the story, he is still in a life-threatening condition. Of course, the danger is decreasing by the day." While the news regarding Massa's condition continues to be encouraging, behind the scenes Ferrari are faced with the task of finding a replacement driver. Doctors have said Massa will be out for at least six weeks, although there are still fears he may never return as a result of his injuries. He will certainly miss the European and Belgian Grands Prix at the end of August, although the current four-week break before the next race in Valencia gives the Italian team time to assess their options. On the list of likely replacements could be Schumacher -- who won five of his drivers' titles with Ferrari and works as an advisor for the team. The 40-year-old German's representative Sabine Kehm told CNN: "There is no offer from Ferrari, but if they decided they need him, Michael would certainly weigh his options." Ferrari spokesman Luca Colajanni later confirmed to the Press Association that Schumacher, who retired in 2006, was an option. "We have said before that it is possible that Michael Schumacher could return to help us out," said Colajanni. "However, we have two test drivers at Ferrari (Luca Badoer and Marc Gene) at the moment and Michael is an advisor. Does safety need to be improved in Formula One? "We have not spoken to him and we will have to wait and see what happens. It is something for (Ferrari team principal) Stefano Domenicali to consider over the coming weeks. "We need to see how Felipe is and the situation will evolve from there. We are not in any hurry, the first and foremost thing is Felipe's recovery." Colajanni also provided further encouraging news regarding Massa, although he played down Bazso's assertion that he could walk out of hospital as early as next week. "I think that on Monday he improved a lot but we have to remain cautious," he said. "It is not useful to put forecasts on these things. I think for the moment we should just enjoy the positive improvements that Felipe is making." Massa was hurt when a spring that had fallen from the back of Rubens Barrichello's Brawn GP car struck him on the helmet at high-speed, causing him to lose control of his car and crash into a tire barrier. On Monday, Professor Robert Veres, the surgeon who operated on Massa over the weekend, told reporters that Massa had suffered some damage to his left eye, which could threaten his future in the sport. "It's too early to say about his future as we don't know the extent of the damage. Without an operation it's very hard to evaluate the eye's function," said Vares. Massa's crash came less than a week after Formula Two driver Henry Surtees, the son of former world champion John Surtees, was killed in similar circumstances, knocked unconscious by a tire which flew off another car in a race at Brands Hatch in England, before crashing. Formula One's safety record has improved dramatically in recent years, with the last fatality in 1994 when the legendary Brazilian Ayrton Senna crashed at Imola.